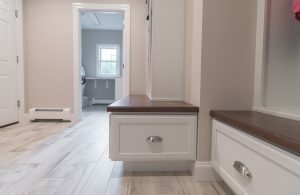 This Laundry and Mudroom renovation project was recently completed for a client in Medfield, MA. 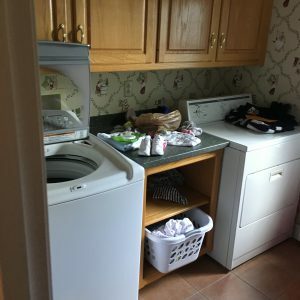 Our client from Overfield Estates was anxious to update her existing laundry and back-hall to get a fresh look and improved traffic flow throughout the space. The back-hall had closets that made the traffic flow a bit cramped and the laundry room (next to the back hall) was also inefficient, with free-standing appliances, cabinets, and a sink and base, all crowding the room, making it difficult to move around. 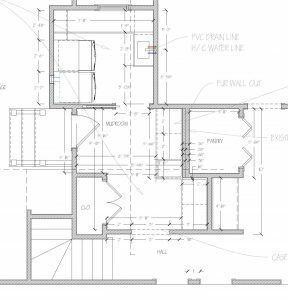 Here’s the existing floor plan showing the cramped hallway and closets and the final floor plan with the closet walls opened up to create a larger feel to the hallway pass through. Cramped hallway from Laundry area. 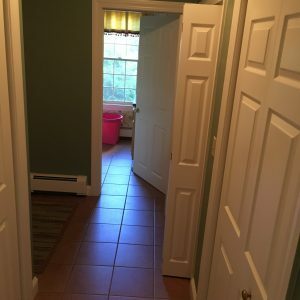 These photos show the client’s desires for updating the finishes and laundry workstations as well as trying to improve the traffic flow throughout the hallway. 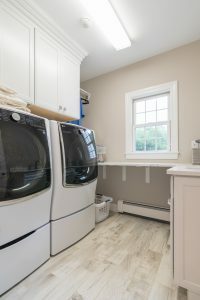 In the laundry space, the client wanted to start by changing out her washer and dryer, adding a folding counter, updating the wall cabinetry and a cleaner, more size-appropriate sink area. She also thought we could improve on the back-hall space by taking off the closet doors and installing lockers to more easily organize the family’s outerwear and sports equipment. Improved hallway with custom bench seating. We accomplished everything she was looking for, in fact, we took the hall closets out completely and opened the entire back hall space, allowing for much better traffic flow. match, providing visual flow between the spaces and a bright, airy feel throughout. We also designed the sink base to be shallower but still functional and continued the countertop as an inverted “L” into the folding table, creating a clean look with more elbow room. 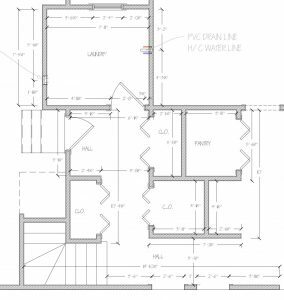 See the “before and after” floorplans to note the relatively simple changes made, that achieved a much larger impact! After the renovations, the client is thrilled with her new spaces! The beautiful, light tan/gray wood grain plank floor tile with the solid wood white cabinets, cherry accents, and pretty, neutral wall color provides an updated, fresh new laundry and mudroom.